This is something that is always at our family gatherings for the Holidays. 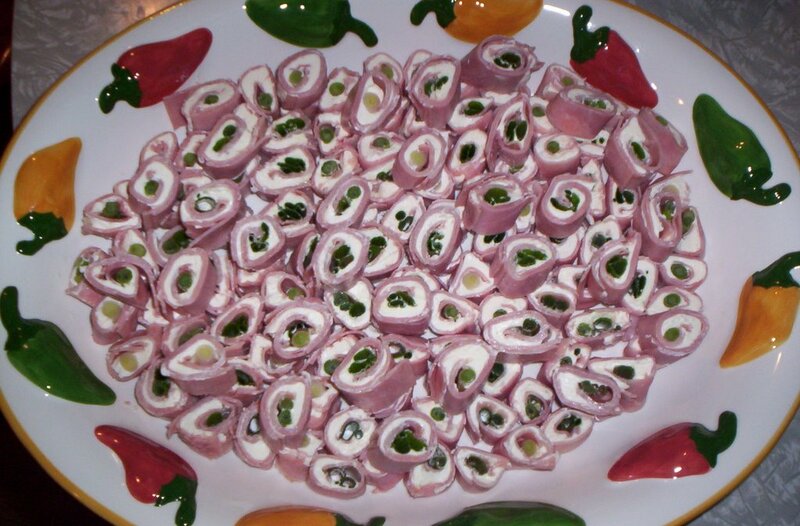 I can still remember being a kid & getting all excited, when I would see a platter of these sitting on the table. **I also add a little bit of garlic salt to the cream cheese. Let the cream cheese sit out until it softens. Spread it onto the sliced ham. Then roll a green onion up in the ham. Cut them into little pinwheels. It's that simple. Enjoy! That picture makes me laugh!! Nevermind I love these too- I just never used green onion. This reminds me of a very similar recipe. We used chipped beef, cream cheese and dill pickles. Yummy! I'll have to try it with ham and onions.